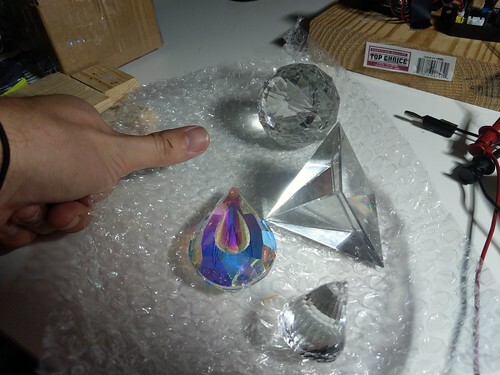 I received 4 'new to me' types of glass prisms today, and while I literally only had 5 mins to play, I'm super stoked to share a glimpse of what I saw. They are all from Amazon. I do have some similar to the spherical one...but not this size. That middle gif is the most exciting to me. Also, seeing some nice beams internal and external to the square-pyramid is going to be fun. Look forward to having some more time to conjure up some nice media to share. Yeah, the more surfaces you find on old chandelier parts, the more light they tend to refract in many directions. But, sometimes less is more. You know? Ooooo sparklies, I like sparklies. NICE stuff Lew I won an auction for a cube at one cent.. 18x18x18 defective.. I assumed the seller would not send and instead give a refund & told them so 'Alan' quickly replied that my item was going out asap -- his English skillz were impressive ( seeing more and more of that) It was quite clear that he valued me more as a buyer than the poor sale. I was his second feedback. (or will be)-- he wants to know what we want..
Lew-- it is an 18x18x18mm-- small but will work . I would appreciate anybody who sees what Alan has for sale/auction would watch or buy- he just got started and WANTS feed back on items we wished he would offer. Of course I replied that we would gobble up any and all one cent cubes. btw he must have majored in English like many we see these days.. so send him a message and your advice -- he is a very nice person. PLZ tell him 'snap' sent you..I am starting a list.. just look at your 'buys' at ekbay..